In my group, we use d20s to track how much production each city is capable of generating each turn. Normally, I only count the production the city generates on its own (in its outskirts) and then add in any scout gathered production during City Management. This way, you don’t have to keep re-counting your production and can just adjust it after building a new building or adding a great person to the city. While each civilization has an obvious strategy that is easiest to follow, I have found that the best way to play is to remember to balance every aspect while putting extra emphasis on your civilization’s strongpoint. You can’t do anything without technology, but technological victories become much easier with some “Exchange of Ideas” culture cards in your hand. Technologic superiority is essential for military conquest too, and researching becomes easier if your economy is strong. So hopefully I have shown you how all four win conditions tie into each other. Balance of these four things will make your win a lot easier. 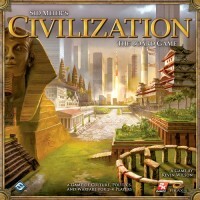 Civilization can be a tricky game to get started with without a thorough read of entire rulebook. Sometimes, you just want to be able to play with some new players. I recently played a game with my sister, who has only played 1 strategy game before in her life (Catan) and her boyfriend (who had never played a board game other than Monopoly). Civilization might seem an odd choice, but they both picked it out of my collection as one they thought sounded the most fun. They had a great time! The game lasted a while, but remained interesting throughout. My sister acquired Uranium and bullied us all with the threat of nuclear warfare. But how to explain such a game to newbies? As with any game, it is best to start with the overall objective. I always start by explaining the theme and tone of the game in an exciting way. ‘In this game, you will become the leader of a great nation and lead your people to glory!’ or something like that. I showed them that there were 4 kinds of victory, and what they ‘looked like’. As in, I showed them the Space Flight card as being one way to achieve victory, I showed them the culture track and I showed them the wealth dial. I felt that military victory was pretty self explanatory. I told them that how to acquire these assets would soon become very clear. Then I took two map tiles, laid one face-up and the other face-down. I said that the majority of the map tiles will be hidden early in the game, but then drew their attention to the face-up tile. I explained that each square had a terrain type, some general resources and maybe a specific resource. I showed them that the symbols on the map corresponded to trade and production. I made sure they knew I understood that they wouldn’t know what these meant, but in the next part of the explanation it would become clear. Then, you simply take your newbie friends through a demo turn with one player on one map tile. Place a city and 2 figures on the tile, and show them how to count up their trade. Explain that trade can be stored up and is collected across your whole nation, while each city has its own production value that cannot be stored up. Explain the city management options. Remember to include how to devote to the arts, and explain that buildings simply replace an old square and give it different bonuses. Wonders are just like buildings, but more expensive and have a little extra bonus. Resources can be spent on certain actions that your researches allow. Next show them how to move their units. Do not bother explaining combat yet – just say that the figures represent the location of your army, and the cards represent actual soldiers with a kind of rock-paper-scissors relationship. Finally show them how they can construct the research pyramid by spending their trade. The rest you can deal with as it comes. Engage some barbarians early on to show them how to do battle. Encourage them with some strategic tips (only build what you need – don’t waste your time on buildings you don’t need, etc). Answer their questions about what different researches do, what culture cards do. They probably will not win their first game, but after a handful of turns, they will be in a position to start making interesting autonomous decisions. Encourage them to negotiate during the trade phase – this was a hugely entertaining part of the game for us (while negotiating might not be always the best strategy, it made the game so much fun, with diplomacy, threats, offerings and trades all coming into play!). The game lasted a lot longer than it said on the box because of the players’ inexperience, but we found that it actually got more exciting as it went on. And, as is clever with Civ, it was surprisingly tight at the top! Most other gamers I know that have the game or usually play it tell me that the expansion is VERY important in correcting the disbalance of how easy it is to achieve the economic victory compared to others. For that reason (and extra civilizations) it is greatly suggested that avid gamers (specially if they know the PC game) buy and use the expansion early on! Seriously, it makes for a much better game and FFG is specially good at releasing good, worthwhile expansions to their games. I’ve yet to see a runaway leader in any game of Civ I’ve played. In fact, we have often seen multiple players achieve a victory condition in the same turn. When this happen, turn order decides the winner. Some people complain about this, but I see it as another aspect players need to manage. For example, if you and another player are going for a tech victory, then you need to be prepared to attack him and steal trade points (the currency for tech research); or if you and another player are going for an economic victory, you need to find ways to block coins (most likely through barricading a coin source). My point is, if you play the game knowing ties are resolved by turn order, then you need to make sure you come plan accordingly. The information provided on the nations card is key to victory. It’s easy to forget the bonus feature they provide, which makes a heavy difference in the game. I’ve played too many games where some players ignore this information and plays illogically. For instance, if you play as Germany, you are almost pushed towards military victory. If you ignore this text and don’t even take the extra military unit when upgrading, you’ve lost your edge to the game. Germany is excellent for military victory, and it’s scary to go up against them late in the game. So take heed to what nation you are given, and try to play as the nation is good at. It could be a game breaker. 1) At least 5 trade on the surrounding tiles: this will boost your trade sufficiently without having to build any buildings. 2) At least one adjacent resource. Spaces that fit this description will not have much production (if any), this does not matter, simply collect the resource every turn, and enjoy the large trade boost. In my experience, this strategy is very effective when possible, don’t ever underestimate the power of being supplied with resources. As a general rule, never attack a hostile village in the beginning unless you have 3-3-2 unit cards or some sort of combat bonus. Even if your cards are 3-2-2 you stand a fair chance of losing. Instead of people racing to a single victory condition, play till two. It forces a slightly more balanced approach, increases the tension and it doesn’t really extend the game length that much. Due to the length of the game, in can be easy to forget that there is a real limit to the number of turns you have to achieve your chosen victory. In most games with experienced players, you can expect the game to end somewhere between turn 10 and 12. By turn 7 or 8, you better have figured out your chosen path to victory! If you haven’t, you probably won’t win. In the handful of games I’ve played, it’s been impossible to win without putting some input into culture. There are some really game-breaking cards to be had, and if you don’t have them, or the culture cards to block them, you are at such a disadvantage that winning is impossible. There is one caveat I have to make: This game has oodles of strategy, and it may be that I just haven’t discovered yet how to counteract the lack of culture cards in your hand. Here is the address for the Official Errata (version 2.2) for Sid Meier’s Civilization: The Board Game. It is in pdf format. Hopefully this may help some people out. Leaning too heavily on one side or another can very easily make you a target, and other players can use you to advance their own civilizations. Give them the guilt by pretending to be weak. If you have a mixture of new and experienced players, it can be an interesting variant to put new players onto a team (of 2) while other players play alone as usual. Both players in a team win if either of them achieve a victory condition and they are encouraged to plan joint strategies. This can help balance the game somewhat until the new players are more acclimated. If your group of players find that economic victory is too easy to obtain, limit the maximum number of coins in technologies to 3 instead of 4. – Elimination. Military victories only, last man standing. I know that elimination isn’t a very popular game mechanic, so this one would only be for players who didn’t mind sitting out. Could make for a drawn out military campaign. Possibly limit the number of techs players can have, too. – 2v2 Elimination. The same, but with two alliances working together. Possibly add a mechanic whereby if two allied figures are in the same square, they may move together simultaneously and enter combat simultaneously. – Wealth nerf. From the expansion to the game. Military defeat allows the winner to steal a coin from the loser. Pillaging of a city earns 2 coins. – Annihilation. Military victory only, but rather than just destroying the capital, the enemy must be left city-less. Make sure you take out those scouts to prevent re-founding. – Peaceful Civ. Well, sort of. No military victory. Battles for loot are still allowed.